Participate in the Summer Fun and Learning! Each year Cookson Hills Electric Cooperative Inc. along with Oklahoma Association of Electric Cooperatives sponsor eighth grade students to Youth Power Energy Camp. The camp is designed to help develop leadership skills, have summertime fun, and at the same time learn about one of rural America's most important industries - rural electrification. Students attending the 2018 Energy Camp are pictured left to right: Madison Wood, Stigler; Shaelyn Campbell, Keota; Newt Johnson, McCurtain; and Riley Buckner, McCurtain. The students who participate in Oklahoma Youth Power Energy Camp have the opportunity to enjoy the pleasures that Canyon Camp in Hinton, OK has to offer. While at Canyon Camp students will enjoy volleyball, swimming, and hiking. They experience first-hand the exciting world of rural electricity, watch safety demonstrations, climb a pole, and take a bucket truck ride. They learn about the history of rural electricity and how electricity affects their daily lives. While at camp students will have the opportunity to sharpen their leadership skills by working with new found friends from every corner of the state to set up and run their own cooperative business. The students serving as delegates from Cookson Hills Electric must be in the eighth grade and be recommended by their school counselor or teachers. 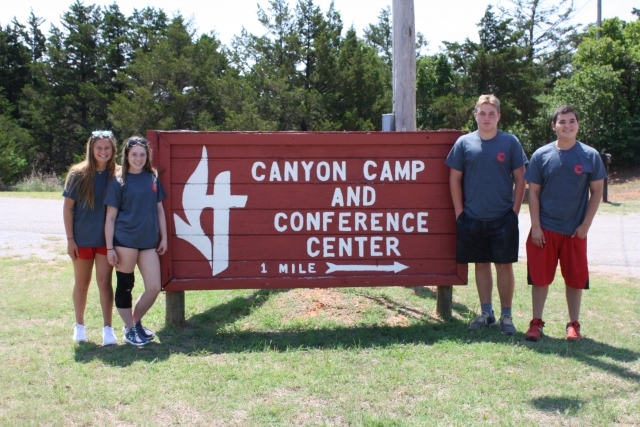 The students who attend this camp are outstanding eighth graders chosen from across the state to represent their local rural electric cooperative during the four days at Canyon Camp.